Usher spring into your home and heart with gorgeous new gardening designs! 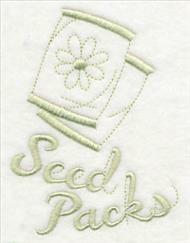 and more let you plant seeds of creativity onto pillows, totes, outdoor gear, and kitchen linens. Scroll down the page to see these beautiful new designs. 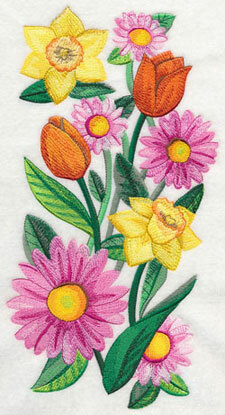 Order today, and plant an embroidered garden on your spring and summery projects. 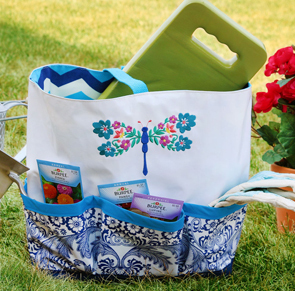 An oilcloth garden caddy is the perfect way to tote your gardening supplies. Find the design used right here. April showers bring May flowers, and this design combines the best of both worlds. Stunning spring florals and greenery fill this bright umbrella with the sights of spring. 6.90" x 10.95" and 5.89" x 9.40" and 4.91" x 7.80" and 4.31" x 6.85"
Rich, intricate details fill these words with eye-catching beauty, while light accents around the letters add an extra level of appeal. 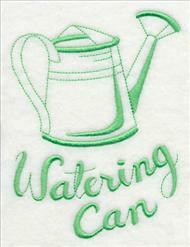 Perfect for pillows, garden flags, and welcome signs. 11.16" x 5.15" and 8.94" x 4.13"
11.25" x 5.02" and 9.00" x 4.02"
7.48" x 3.35" and 6.56" x 2.94"
Fans of the existing blooming word designs spelling "Home," "Family," "Blessed," and "Love" will recognize the unique style and striking coloring of these motifs. Stitch them together for a lovely, cohesive look. 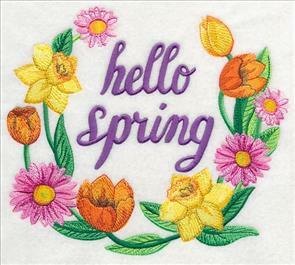 11.74" x 5.22" and 9.40" x 4.18"
11.09" x 5.20" and 8.88" x 4.17"
7.39" x 3.47" and 6.49" x 3.04"
Welcome spring with beautiful blooms and bright colors! 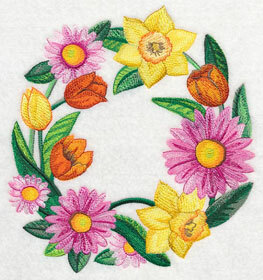 Tulips, daffodils, and more blossom in these beautiful wreaths. 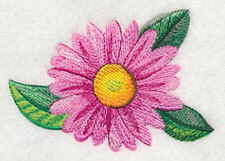 Perfect for tote bags, table linens, welcome wall hangings, and more. 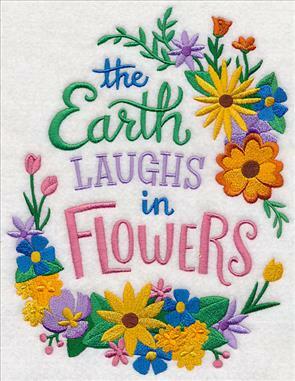 6.30" x 5.50" and 5.54" x 4.85"
Give a pant leg, t-shirt, or jacket back a bright and colorful update thanks to the incredible blooms found in this floral spray. 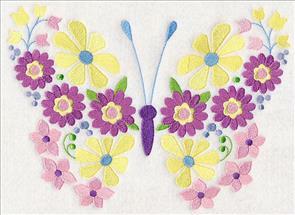 Stitch it on its own, or pair with one of the other watercolor spring designs for a spectacular display. 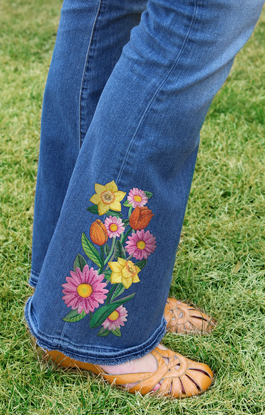 4.22" x 7.79" and 3.71" x 6.85"
Get tips for stitching on denim in this fabulous tutorial here. 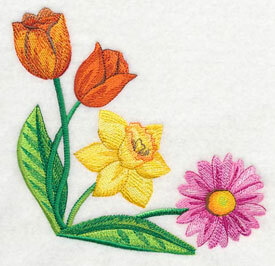 Repeat this blooming border down a table runner, or use it to embellish tablecloths, placemats, or an apron. A fabulous way to bring spring into your kitchen and dining room! 11.75" x 4.06" and 9.40" x 3.25" and 7.80" x 2.70" and 5.70" x 1.98"
Corner designs shine on napkins and pockets, and are equally appealing stitched on a variety of projects. Add the coordinating single flower for a beautiful pairing. Celebrate the start of spring with these beautiful blooms. 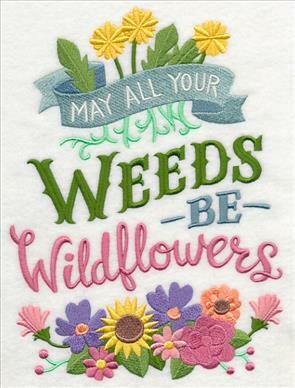 Sweet and charming garden sayings and samplers add a too-cute look to any embroidery project! 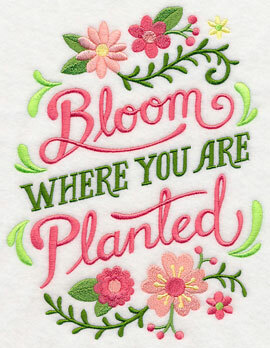 Stitch the "Bloom Where You Are Planted" design on kids' gear, home decor, and more; "I Love Gardening from my Head To-Ma-Toes" is a punny addition to towels and wall hangings. 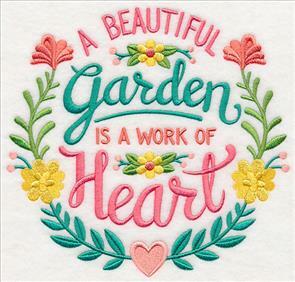 6.68" x 7.81" and 5.85" x 6.84"
4.85" x 5.67" and 3.30" x 3.86"
An abundance of gorgeous flowers fills these embroidered quotes with the beauty of the garden. 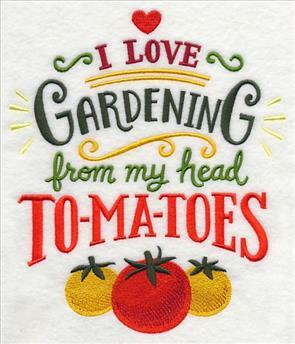 Terrific additions to gardening aprons, tote bags, pillows, and more. 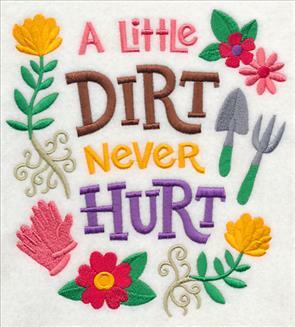 6.90" x 9.38" and 5.74" x 7.80" and 4.85" x 6.60"
Don't be afraid to share your love for gardening on your next embroidery project with these fun quotes and sayings. 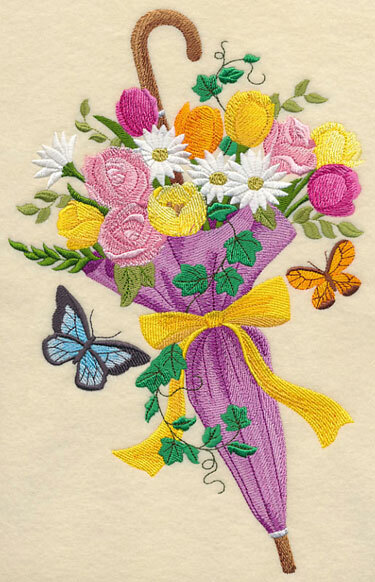 Adorable accents, bright colors, and eye-catching text add brilliant detail to the designs. 7.31" x 6.90" and 6.21" x 5.86"
5.15" x 4.86" and 3.86" x 3.64"
You know what they say: "You can't buy happiness." 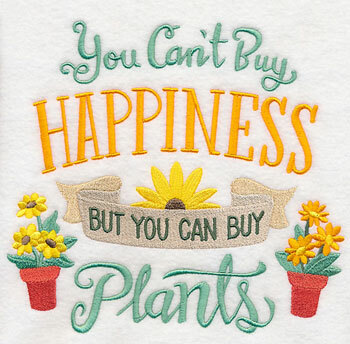 But you can buy plants, and isn't that pretty much the same thing? 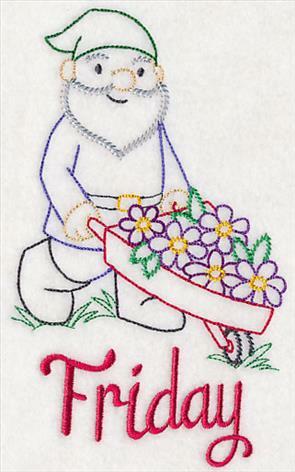 Adorable on gardening totes, shirts, and more. 7.81" x 7.21" and 6.93" x 6.40" and 6.33" x 5.85" and 5.25" x 4.85" and 3.86" x 3.56"
A beautiful butterfly, elegant dragonfly, and other classic garden motifs are made up of various types of flowers and greenery. Evoke the wonder and whimsy of your own garden in bloom with these stunning outdoor designs. 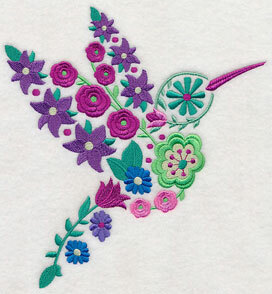 7.81" x 4.52" and 6.85" x 3.97"
A hummingbird and daisy finish off the quartet of blooming garden designs. 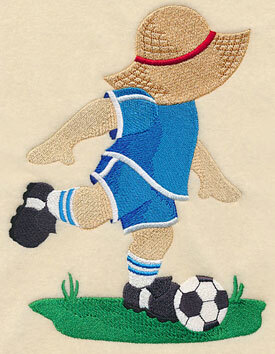 Impressive additions to garden gear, placemats, pillows, towels, apparel, and so much more. 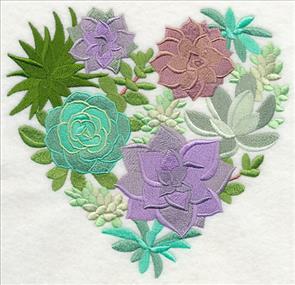 Succulents of every shape, size, and color get their time in the spotlight in this sweet heart design. Varying styles of stitches evoke the natural look of beautiful, thick leaves. 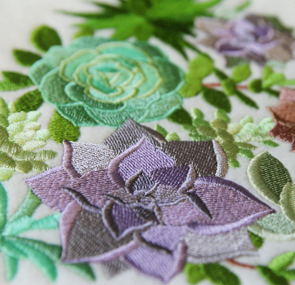 7.25" x 6.90" and 6.15" x 5.85"
5.10" x 4.85" and 3.85" x 3.67"
Add depth and texture to your embroidery with this striking succulent design. Light colors, sketch-style elements, and sophisticated text give this gardening collage an unexpected level of elegance. 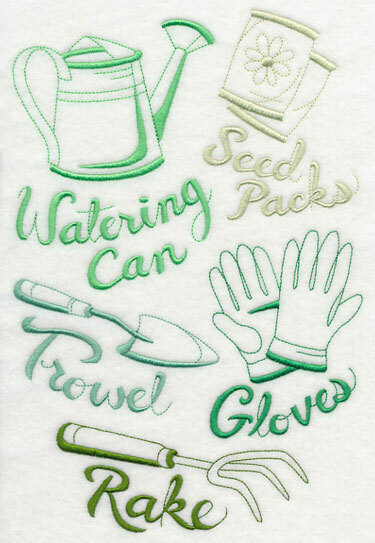 Perfect for stitching on gardening gear, tea towels, totes, and more embroidery projects. 6.85" x 10.22" and 5.23" x 7.81" and 4.59" x 6.86"
Each of the gardening tools and supplies have been separated from the above collage and are available for individual purchase, too. 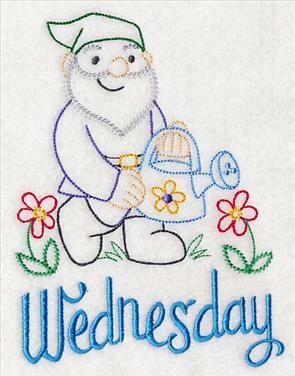 3.00" x 4.07" and 2.01" x 2.74"
4.94" x 2.14" and 3.32" x 1.44"
Make a set of tea towels for your kitchen with the cheerful and charming garden gnomes in this Days of the Week set! 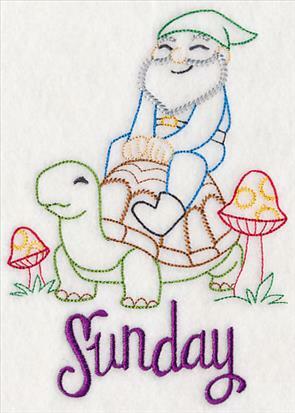 Here a friendly gnome takes a ride on a turtle while his friend grabs a spade and is ready to start digging. 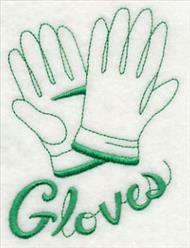 4.59" x 6.71" and 2.59" x 3.79"
Each of these designs has been created in the special "vintage' style, meaning they're modeled to resemble classic antique hand embroidered linens. Plus, they're light and airy, and delightfully quick-to-stitch, too. 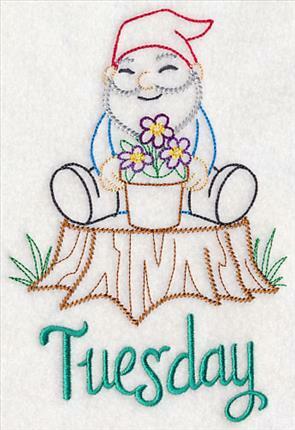 4.92" x 6.48" and 2.79" x 3.66"
Light and cheery, these cute-as-a-button garden gnomes will dig their way into your heart. Their bushy beards and smiling faces are a welcome addition to any project. 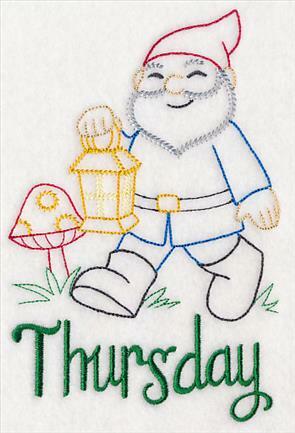 4.16" x 6.87" and 2.33" x 3.85"
The days of the week are stitched on the last color stop for these designs, so you can stitch the gnomes on their own. 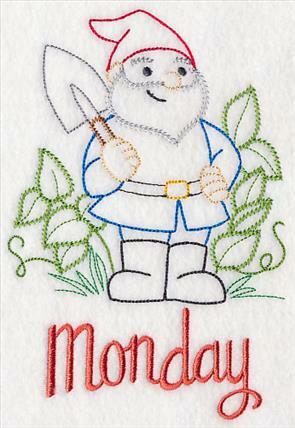 Make a set of Days of the Week towels for your own home, or present them to a friend or family member as a sweet gift. 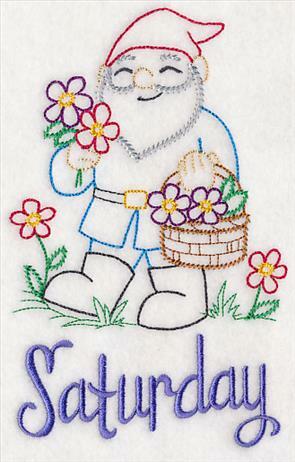 4.33" x 6.88" and 2.43" x 3.86"
Purchase these colorful garden gnome designs individually by clicking the links above, or get all 7 of the designs in a pack. 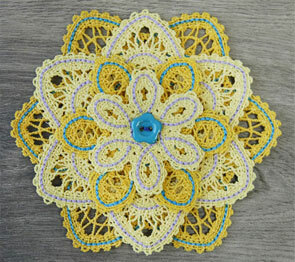 Layers of freestanding Battenburg lace come together to make a beautiful blooming flower. It's a gorgeous addition to home decor, fashion accessories, and more. 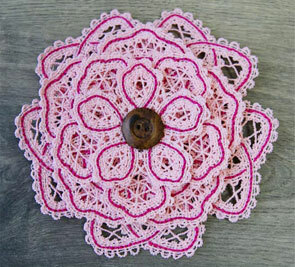 Find the free tutorial for these layered lace flowers right here. 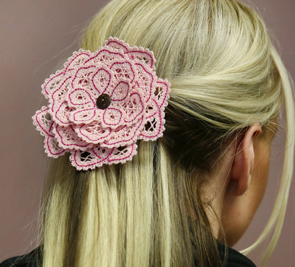 5.50" x 5.71" and 5.05" x 4.87" and 3.90" x 3.84"
A simple hair clip transforms this blooming lace flower into a stunning hair accessory. 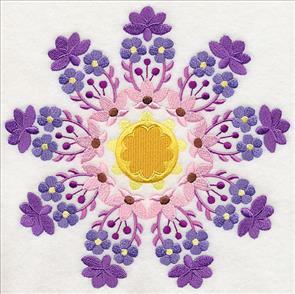 A button adds a pop of color to the flower, as well as holds all the layers together. What a charming way to decorate for spring! 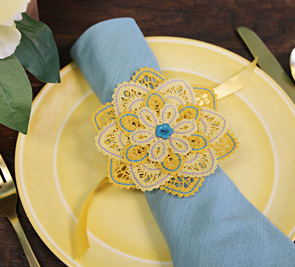 5.51" x 6.20" and 4.87" x 5.49" and 3.46" x 3.89"
for a do-it-yourself napkin ring! 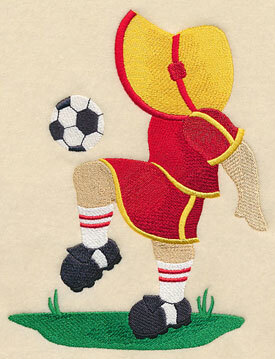 Carol loves the Baseball Fisherman Fred and Sunbonnet Sue designs, and requested a soccer version to use for her grandchildren. 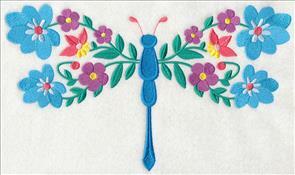 She plans to embroider the designs with their names underneath. Thanks for the suggestion, Carol! 5.86" x 7.60" and 4.84" x 6.28" and 2.93" x 3.81"